Gap, the apparel company, has clearly learnt from its mis-step over “Hurricane Sandy”. 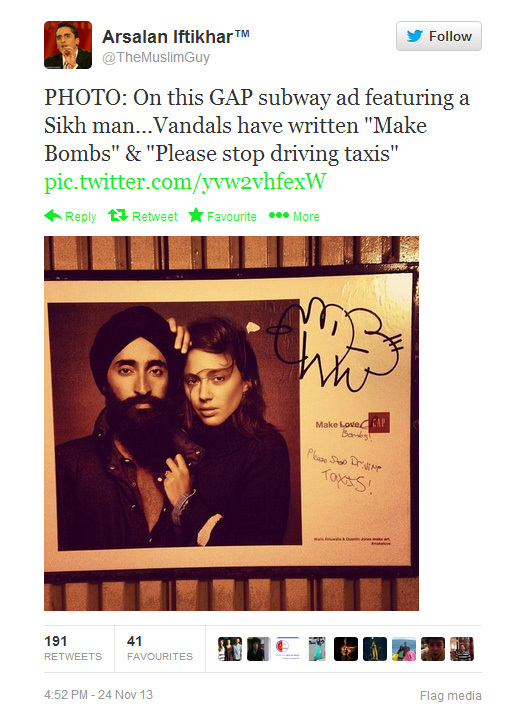 According to Huffington Post: "Arsalan Iftikhar, senior editor at The Islamic Monthly and founder of TheMuslimGuy.com, posted a picture to his Twitter and Facebook wall of a defaced subway advertisement for Gap featuring Sikh actor and jewellery designer Waris Ahluwalia. The caption had been changed from "Make Love" to "Make Bombs," and the writer had also scrawled "Please stop driving TAXIS" onto the poster. Gap responded very fast by not only asking the location of the defaced ad, but also made the ad its cover picture on Twitter. Great response to racism by Gap! The story has gone viral since. According to Yahoo News Coca-Cola Philippines suspended all advertisements for all its brands via all media channels from November 18.